Steampunk Jurassic Park? Sign me up! Christmas is only a week away, and that means everyone except that oh-so-perfect neighbor of yours is frantically shopping for last minute gifts. So what about those people on your list who always have you stumped? Well, everyone loves to be entertained and everyone loves to relax, so how about you give them something awesomely entertaining to waste the hours away? 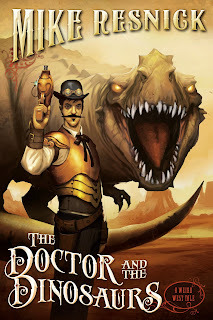 Enter the fantastic Mike Resnick and his just-released book The Doctor and the Dinosaurs: A Weird West Tale. There's just something awesome about the good ol' Wild West. Who wouldn't want to start a gunfight in a dusty bar over a bad game of cards? And no one will argue that dinosaurs are cool, what with their colossal stature and a bite force of up to 12,800 lbs. Yikes. This book is the perfect blend of Western and steampunk with Doc Holliday (yes, THE Doc Holliday) taking the lead in a very unusual adventure. The Doctor and the Dinosaurs is the perfect last minute gift for almost anyone on your list. Take a break from gorging on Christmas cookies to run down to your local bookstore for a copy. No time to shop? Does that special person have an ereader? Online retailers let you buy and send the book as a gift with just a couple clicks! You can even have it sent on December 25 so the "no peeking" rule is guaranteed. Now go finish those lists before it's too late. And by "too late" I mean trying to drive and sign that card you just bought at the same time before running inside and yelling "Merry Christmas everybody!" I wouldn't suggest it.